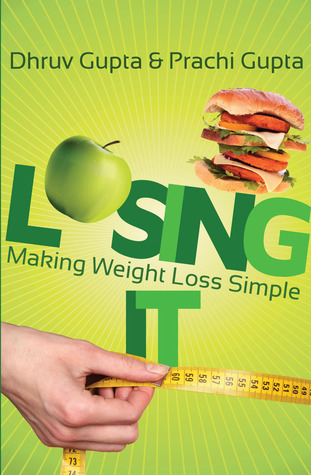 Presenting Losing It: Making Weight Loss Simple by Dhruv Gupta & Prachi Gupta. You have probably tried losing weight at some point in your life, or at least thought about it. Well-meaning and well-intentioned articles, websites and ‘experts’ give out advice on losing weight through the latest research, ‘super’ foods or following ‘magical’ weight-loss techniques. This complicates the process and gives out conflicting information. Losing It is a coherent how-to that provides you with the pros and cons of healthy foods and foods which have ‘healthy’ claims attached to them, beverages and exercise. It gives you tips that are easy to tie into your daily life, resulting in long-term weight loss while helping you gain in nutrition and fitness. Faced with stores full of choices and the demands of a busy life, how can you put together a balanced meal? What foods have empty calories and which ones really help you? Is brown bread good for you? Is banana fattening? What are the healthy choices you can opt for when eating out? Does going to the gym help? What’s holding back your weight loss? Losing It addresses your everyday burning queries and concerns simply, and is chock-full of tips and suggestions for you to lose weight effectively. Informative and user-friendly, this is a book that can accompany you in your bag or purse as easily as it rests on the bookshelf. I don't read weight loss books and neither do I review them on my blog....let me be clear. But Pan Macmillan India sent this to me....so I am honor bound to do the job as a book reviewer. I don't read much weight loss books because most of the knowledge about the subject I have already read and learned from in school, biology texts and the internet and virtually all of them are the same. Well same is the case with this book as well. Going into the matter as simply as possible this book lays out some cheap tricks and advice and simple diet plans that anyone can follow to stay in shape and maintain it. The exercises, the food plans, what to eat and what not to eat and some success stories; a short index to the book and helpful too.